2018 has been a great year for market, especially for large cap players. With Nifty recently touching all time high, there is a sense of euphoria among investors as more money in being pumped in the market everyday. Market has a habit off catching investor’s off the guard. Just when you think nothing can go bad, they do. This time it’s no different either, while the market is celebrating its success, somewhere deep down, there is a looming threat that a market correction is round the corner. In this post, I am going to share my observation of 5 signs that show that market may crash in 2019. Banks are the backbone of any economy. Especially in the emerging countries like India, where less than 2% of the citizens invest in stock market, banks play a crucial role in keeping and growing our money. For the past 5-10 years, there has been a significant rise in NPAs(Non Performing Asset) of banks, especially in Public sector banks, that provide 80% of the credit to the Industries. PSBs like PNB, SBI and many other small and midcap banks have NPAs higher than their market capitalization, which is continuously rising every year. As per RBI recent data, in the year 2017, the total Net NPA of all the Public Sector Banks (excluding SBI and associates) is around Rs. 2,86,156.7 crores, 13% higher from 2016 of Rs. 2,51,568.1 Crores previous year. If these banks do not settle their NPA issue soon, chances are they will need another recapitalization from the Government to bail them out from going bust. Recapitalization will put a lot of pressure on the taxpayers, leaving them with little savings. Clearly, banks that are have the responsibility to support the economy and the market may now be the reason of a crash. Rising USD vs INR combined with rising crude oil prices is the second but the biggest threat to our market. India is a Net importer of goods and services. In 2016, India exported goods and services worth $261 billion while imported good and services worth $339 billion, giving us negative trade balance of $78 billion. Among the top products imported by India are crude oil which contributes $54.8 billion and Gold which contributes $22.9 billion. Rising Dollar combined with rising crude oil prices is deadly combination. As all international payments are made in Dollars, India has to buy more dollars to settle its payments, which will lead to higher demand for dollar and thus rise in its prices. On the other hand, rising crude oil prices are another threat. While high exchange rate makes USD expensive, rising Crude oil prices means India has to shell out more dollars for each barrel of oil, putting pressure on the domestic economy. Political risk is the biggest threat to the market. Back in 2004, when NDA lost the election and UPA-1 came to the power, market tanked amid political uncertainty. Similar threat can be seen in the current market as well. Markets had seen a fabulous rally in 2017-18, which clearly shows that market has not priced in the possible defeat of BJP in the 2019 election(in case it happens). As per Mr. Raj Bhatt, Chairman of Elara Capital, if BJP or its NDA partners do not get the majority, it will be a setback for the market. 2019 being an election year is going to be a year full of volatility, providing lot of opportunity to speculators to make news based bets and long term investors an opportunity to find good stocks at a discount. Foreign investors form a big part of our capital market in the form of FIIs, most of these FIIs are US based investment managers. With recent tax cuts announced by President Donald Trump, inflation is expected to rise further. With strong Job market, low unemployment and rising income, economists. tracking US Markets closely expect two more hikes of 25 basis points in interest rates this year. Higher interest rate will attract FIIs towards a safer investment avenue, leading to pulling out of funds from Indina stocks market. 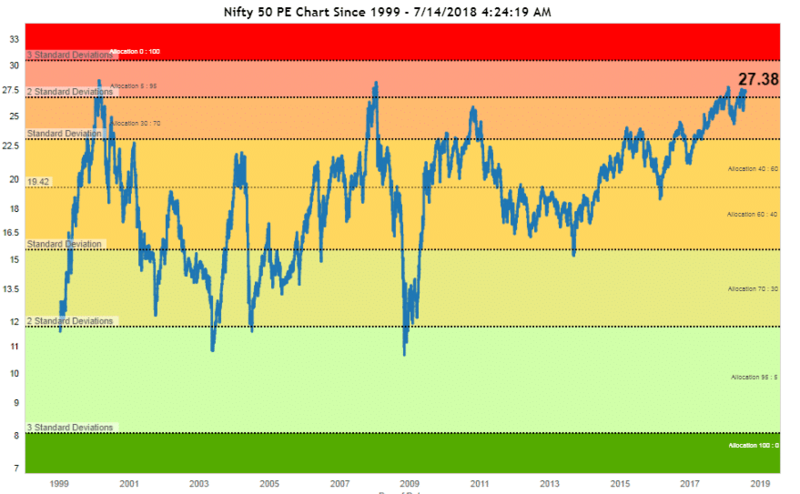 If we look at the past 20 years of Nifty’s historical P/E, there is a clear pattern which shows when the market is overvalued and a correction is due. To demonstrate that, here is the Nifty Historical P/E chart for the past 20 years. If you analyze the chart, you will find, every time the Nifty P/E was above 25-27, there was a correction. On the other hand whenever the Nifty P/E was below 15-12, the markets bounced back to another rally. Currently, Nifty is trading at a P/E of 27.38, a level which is unsustainable for long term, indicating a correction coming soon. The purpose of writing this post is not to scare the investors. It is the very nature of the market to move in bull and bear cycle. It has happened in the past and it will happen in the future as well. The reason behind writing this is to give you my interpretation of the global and domestic indicators and what they tell us. Since markets are trading at expensive valuation, any correction would be a good opportunity to buy quality stocks at a discount. All these signs are strong enough to cause market correction. Both macro and microeconomic data shows that market is due for a correction or a crash. While a correction may not be as bad, but if there is a crash due to unforeseen events (such as a war), it would be advisable to book profit and wait for the right investment opportunity.